Cross posted on the Langwitches Blog. I usually try to explain and emphasize, that these skills are precisely what are being taught. We are not podcasting in order to teach Audacity nor Garageband. We are not recording students for the fun of using microphone, we are not blogging, so we can practice typing, we are not skyping for the purpose of using a webcam. Parents and administrators, unfamiliar with the tools, also seem worried that “important” academic time is being lost and wasted! In an attempt to explain that there is so much more involved when using technology tools, I blogged a few months ago, We Podcasted Today So, did you learn anything? It is important that we explain to parents and administrators that we are using the tools to practice the above mentioned basic literacy skills, engage and motivate students, but also address, integrate and embed so many more skills and literacies. What are some other technology tools you are using in the classroom? 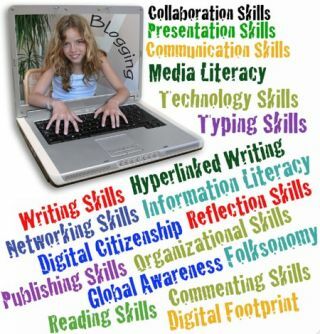 What are the skills and literacies that you are addressing? How can we educate parents and administrators that blogging, wiki-ing, podcasting and skyping, etc. are simply a vehicle to preparing students for many skills and literaciers, including the 3Rs they are accustomed to and familiar with.